In her new book Critical Issues for Student-Athletes: Going Behind the Invisible Wall, NC State Education Professor Joy Gaston Gayles offers a critical approach to dealing with the complexities of problems that arise from big-time college sport entertainment enterprises on college campuses across the United States. Peers across the nation elected Joy Gaston Gayles as an at-large member to the Board of Directors of the Association for the Study of Higher Education (ASHE), an organization with over 2,100 members dedicated to higher education as a field of study. In addition, Gaston Gayles has chaired or served on the dissertation committees of 13 women of color. For the past three years, she also has served as a faculty coach for the National Center for Faculty Development and Diversity through which she has coached 64 faculty through a 12-week mentoring program. Divided into eight chapters on issues ranging from capitalism and racism in college athletics to the inclusion of transgender student-athletes, Gaston Gayles, with input from nine researchers from other institutions and NC State doctoral students Ezinne Ofoegbu, Joy Tongsri and Heather Ryan, explain critical issues in college sports and offer recommendations and solutions to move the industry forward. 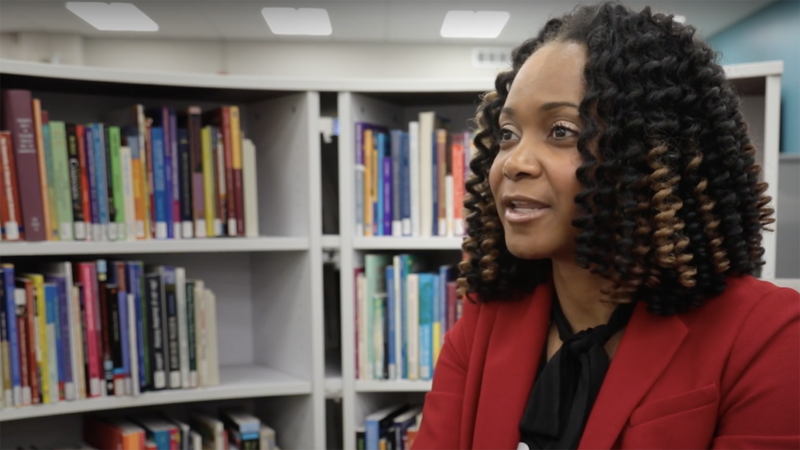 In the Q&A below, Gaston Gayles discusses why the work she’s doing is important and how she hopes this new book can help institutions recognize issues and facilitate positive change. Responses have been edited for length and clarity. When did you recognize the lack of support and guidance on issues related to big-time college sports enterprises and the impact they have on student-athletes? I am a former student-athlete. I played softball on athletic scholarship at a Division II institution, and I received a postgraduate scholarship from the NCAA to enroll in graduate school. I completed my master’s degree in Auburn University’s higher education program. At the time Auburn had a special focus in intercollegiate athletics and higher education. Every quarter, in addition to my coursework, I had practicum experience in a different area of the athletics department — for example, one quarter I worked in compliance, another quarter I worked in media relations, another quarter I worked in academic support. That was the first time I noticed big differences in college sports at different institutional types. I was constantly comparing my experience at a Division II school with what I saw at a large Division I institution that had a big-time athletics program. In my experience, I participated in college sports as a means to pay for my college education and that was true for most of my peers. None of us had aspirations to go pro. However, that was not the case at Auburn University. I had not experienced up close and personal, that level of competition, the quality of the facilities, and the fact that the games were televised on national television networks every week. Why is it important to highlight these issues that are unique to student-athletes and offer guidance on how to support those students? Many of the issues that are covered in this volume are considered taboo — meaning there’s not much conversation happening about the topics covered in this volume. It’s difficult to talk about some of these topics because they are incredibly sensitive; yet, they are critical issues that student-athletes face every single day. How can institutions facilitate dialogue and constructive conversations to tackle issues and systems that take advantage of vulnerable student-athlete populations? This volume is a tool to spark conversation and inform research, policy and practice on these sensitive problems. We include guidance from the research literature on ways to facilitate dialogue and have crucial conversations. These tools — like setting ground rules and explaining oppressive systems, how they work, and how they can be damaging to everyone — can help guide important conversations. It also involves providing space to come up with creative solutions for doing things differently and trying new approaches to empower all parties and help them thrive within the environment. I want student-athletes to reap the benefits of participating in college sports and experience gains in personal development and learning. Where do you hope to see college sports go in the future? How likely is it for that hope to become a reality? This topic is so important for me because, as a former student-athlete, I know the benefits of participation in sports. However, many of those benefits are outweighed by the scandals and the not-so-good things that happen in connection to college sports. The United States is unique in that we are the only country in the world that has a connection between athletics and Higher Education. I think that’s very special, and I think that there is a lot of good that can come out of this marriage of sorts. Many of the leadership skills that I have today, such as teamwork and working with people different from myself towards a common goal — I learned through participating in sports. It was a great way for me to practice leadership skills, as well as learn some tough lessons and deal with hard situations — those are skills that I’ve used in other areas of my life. I learned how to win, and I also learned how to lose. I learned how to take constructive feedback and use it to make myself better and improve my game so that we could win together as a team. So that’s really my hope for college sports — I want student-athletes to reap the benefits of participating in college sports and experience gains in personal development and learning. What do you hope is the takeaway for the book? I hope this book is received as a conversation tool for talking about some topics that are not typically talked about in the literature nor on college campuses. I hope that athletic departments will also make use of the book and use it to increase their knowledge and awareness about many of the issues that they see every day and I hope they can use some of the recommendations offered in each chapter to improve practice. I also hope that the book gives voice to student-athletes who are sometimes marginalized and gives them language to express some of what they may be experiencing and ideas about how to have conversations and advocate for themselves in a positive and constructive way.